An overnight success 9 years in the making, photo-sharing site 500px didn't really take off until last year. Since then, it's been capturing a lot of professional (and want-to-be professional) photographers away from Flickr. The early-adopters that have made the switch have been posting some amazing photos, which tends to attract other great photographers, creating a righteous circle that should lead to more growth for the site. Right now, the smaller community means that it's easier to get your photography noticed. 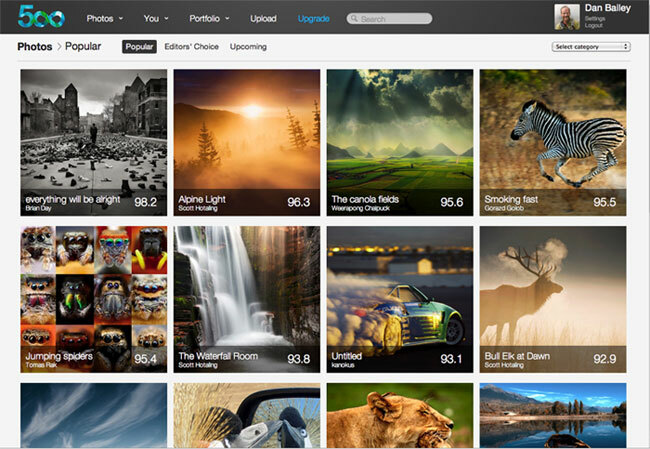 While Flickr has a lot of options, 500px goes for more of a minimal approach. You can't do as much with the site, but less options means a leaner interface with more room to show off the photos, putting them font and center, which is what many people find attractive about the site. Each photo is given a "pulse", which is a metric of how popular a photo is based on how many people "like" it. A photo's popularity automatically declines over time, so it's easier to get your new photos on the front page. The simple interface of 500px lets the photos do the talking. One new feature of the site is ability to sell your photos easily. Photos for sale on 500px come as either a HD digital download for $2.99 (the photographer makes $2), or as a canvas print (the photographer makes around $40 for each print). The system is very limited currently - you can't set your own price, you can't sell different resolutions, ,you have to meet the 500px standard size constraints, and you can't dictate license terms. You can sign up with 500px for free, and upload up to 20 pics per week, or pay $50/year for their "Awesome" account. That lets you upload an unlimited number of photos and track image views with Google Analytics.